Multi cuisine restaurant situated next to the lobby, with terracotta floors, granite pillars, ethnic artifacts and prints on the walls, and an entirelength open to splendid views of the garden. An open air Tandoor is functional during dinnerbeside the pool. Every night performances of a traditional Kerala art form are staged for guests here. At Amruthum, ethnic Kerala style dishes are cooked using traditional recipes handed down generations. The emphasis is on fresh ingredients abjuring the use of artificial colors and preservatives. The coffee shop serves excellent blends of tea, coffee, fresh fruit juices and beverages besides a range of Indian snacks. Built in the manner of a 'machan; on long stilts, with wooden walls and thatch roof, guests enter over a rope bridge. 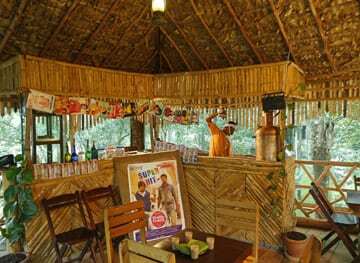 Inside, the decor is reminiscent of the popular tea houses of rural Kerala with rustic wooden and bamboo furniture and a counter adorned with cinema posters.Set high amidst the trees and open on to the surroundings on all sides, nestled in the canopy, the view is breathtaking. © 2018 Greenwoods. All Rights Reserved. Powered by Levos.